Home / GST / How to Convert your GSTR 2 Json in Excel? How to Convert your GSTR 2 Json in Excel? JSON file is a type of computer file based on Java that is easy for humans to read and write. JSON file is used by the GSTN for GST return preparation and filing. GST returns can be filed on the GST Portal using a JSON file. The Government has provided an offline GST return preparation tool that generates JSON file that can be filed on the GST Portal. GST portal allows you to download the Json file for GSTR 2A for your inward supplies. That needs to be reconciled with purchase register to check whether all the input tax credit one is eligible has been received or not. The Json file which comes from the GST Offline Utility doesn’t get directly converted into excel. That is making it very difficult for the tax payers to reconcile the entries in GSTR 2A report with purchase invoices. Matching/checking the entries one by one using the offline utility software provided by the GST Portal with your purchase invoices/register is very time consuming for the ones who have large number of invoices. It will help you to convert the Json File which is created by the GST Portal to Microsoft Excel Format and it will make it easy to reconcile the data by using V lookup formula. Step-3 From Prepare Offline GSTR 2 tab, you can see upload and download option & Click on download. Json file will be downloaded. Step - 4 - Download latest offline utility and import GSTR 2 through 2nd option "Open Downloaded Return from GST Portal". Step - 5 - Click on Export to Excel and save the file on your system. Its Done. Now open and compare your original data with uploaded Data. Step-3 From Prepare Offline GSTR 2 tab, you can see upload and download option & Click on download. 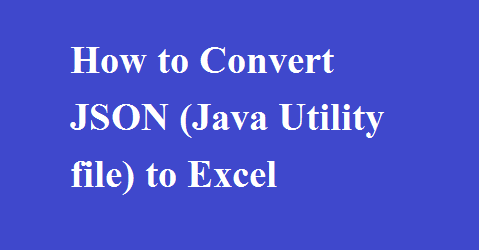 Step-4 Download the Offline Utility software of the JSON file converter to Excel using the below link. Step-4 Convert this to CSV Format. Step-6 Convert the same and generate the file, you can view the excel data in the Output folder.